I love the slippers. Some how I didn’t notice those before but now you are focusing on the floor they really pop. This piece always makes me smile. You’ve made great progress! 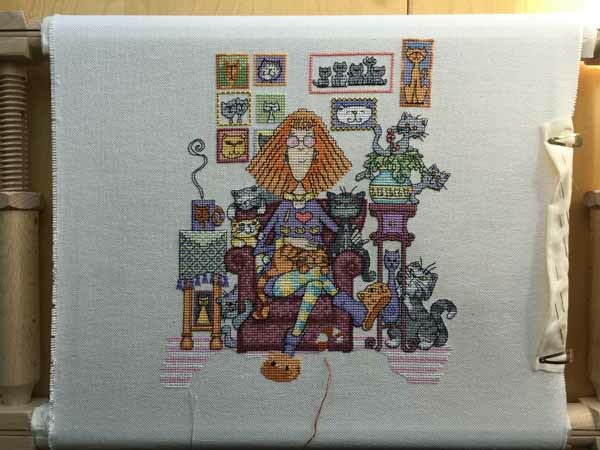 This is such a fun design, and I’m guessing two more cats on the rug? This lady is truly hilarious! Nice progress. I am so looking forward to seeing what this looks like all finished. It is an adorable piece. Love your progress! I read through the comments and decided to go look for something I didn’t notice before…I did! Just now noticing the handle on the mug is a cat tail!!! LOL! Am i right? Great progress! Can’t wait to see what the rug looks like. Looks like you may be close to the finish line? Thanks. Getting closer, but what you see of the rug is pretty much it. Lots of stripey floor to do though. I love love love this design! I’m with Avis; every check-in I feel like I spot something I hadn’t noticed before — like that she’s wearing a cat necklace over her cat jumper. So lovely! Thanks. I do love those tassels. They were fun to do and I think they look so effective. Great Progress Carol. This looks as though the first post of next year could be starting with a Happy Dance. Like you we don’t really do Christmas. We have reached an age when if we want something we have it so there is often nothing either of us want. Its family time and as long as the children and grandchild are happy so are we. Thanks. I’m hoping so. I’m so close to the finish line that I’d really like to finish it this year, but I suspect it’ll be January if I’m lucky. great progress Carole, we can see outlines of new cats appearing. 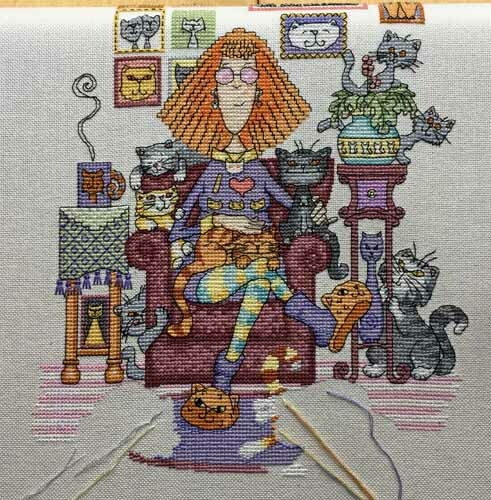 How many cats does this mad cat lady have???? And naughty you, playing with a xmas present before xmas! I know what I’m getting, since I bought it on eBay, but it’s been hidden away in the cupboard since it arrived and I’ll wait until Dec 24th before playing.